On August 14, 1480, a massacre was perpetrated on a hill just outside the city of Otranto, in southern Italy. Eight hundred of the city’s male inhabitants were taken to a place called the Hill of the Minerva, and, one by one, beheaded in full view of their fellow prisoners. The spot forever after became known as the Hill of the Martyrs. 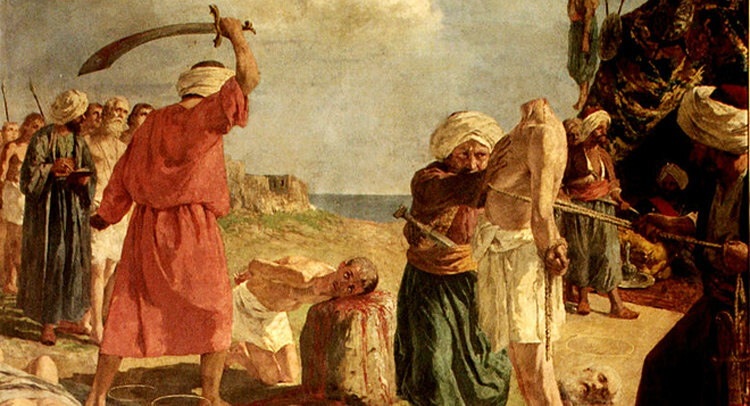 In medieval warfare, the bloody execution of a city’s population was commonplace, but what happened at Otranto was unique. The victims on the Hill of the Minerva were put to death not because they were political enemies of a conquering army, nor even because they refused to surrender their city. They died because they refused to convert to Islam. The 800 men of Otranto were martyrs, the first victims of what was fully expected to be the relentless conquest of Italy and then all of Christendom by the armies of the Ottoman Empire. Because of their sacrifice, however, the Ottoman invasion was slowed and Rome was spared the same fate that had befallen Constantinople only 27 years before. On May 29, 1453, the venerable city of Constantinople, the capital of the Byzantine Empire since its founding by Constantine the Great in the fourth century, fell to an army of 250,000 Ottoman Turks under the personal command of the 21-year-old Sultan Mehmet II. Earning his title, el-Fatih (“the Conqueror”), Mehmet completed the centuries’ old war against the Byzantines and made the once-great Christian city the new capital of his Islamic empire and the launching point for his grand plans of dominion over the West. Ottoman armies were soon once more on the march, this time headed straight for the heart of Europe. Mehmet laid siege to the city of Belgrade, but his troops were repulsed by the Hungarians. Even so, the campaign ended with the Ottoman occupation of Serbia and a strategically strong position to push into the rest of the Balkans, including Wallachia (Romania) and Moldavia. Mehmet was relentless in his next efforts. Defeated in 1475 by Stephen the Great of Moldavia at the Battle of Vaslui, the Sultan merely waited until the next year to launch yet another army into the field. This time he crushed the Moldavians at the Battle of Valea Alba. More progress would have been made had Mehmet not been checked in the mountains of Wallachia by a foe even more determined and just as merciless: the Wallachian prince and one-time vassal of Mehmet, Vlad III Tepes, known to history as Vlad the Impaler, or Vlad Dracula. Rebuffed for the moment in the Balkans, Mehmet turned to completing a task he had set himself back in 1453. After the fall of Constantinople, Mehmet claimed one other title alongside that of el-Fatih. He called himself Kayser-i Rûm (“Caesar of Rome”) on the basis that he was successor to the throne of the Byzantine Empire and also a descendant of Theodora Kantakouzenos (daughter of the Byzantine Emperor John VI Kantakouzenos) who had been married to Sultan Orhan I (r. 1326-1359). Mehmet announced his intention to invade Italy, capture Rome, and bring together both halves of the Roman Empire. The campaign would also mark the final defeat of the Christian cause in Europe by the conversion of the city of the popes. St. Peter’s Basilica would serve as a stable for the Ottoman cavalry. Mehmet halted the ongoing siege of Rhodes—brilliantly defended by the Knights of Rhodes—and ordered large elements of the Turkish army and navy there to set sail for the Italian peninsula. The fleet comprised at least 90 galleys, 15 heavily armed galleasses, and 48 lighter galliots carrying over 18,000 soldiers. Their initial target was the Italian port city of Brindisi, in Puglia (or Apulia), the southeastern corner of the peninsula along the Adriatic Sea. The city was an ideal choice as it offered a large harbor for the ships. The commander of the Ottoman force, Pasha Ahmet, was one of the most formidable of Mehmet’s generals. He intended to capture the port and then advance immediately north toward Rome while Ottoman reinforcements arrived to consolidate the seized territory. The movement of the fleet was aided considerably by the absence of resistance by the maritime power of Venice. The Venetians and the Ottoman Empire had been fighting each other off and on for dominance in the eastern Mediterranean and Adriatic since 1423. Much to Mehmet’s pleasure, the two powers signed a peace treaty in 1479 that ended hostilities, at least temporarily. The Sultan thus attacked Rhodes and then launched his campaign on Italy without fear of the Christian state of Venice blocking the progress of his armies. The Adriatic’s weather did not cooperate, however, and the famous winds forced the fleet to land not in Brinidisi but some 50 miles to the south, at Roca, near the city of Otranto. The city is located on the eastern shore of the sub-peninsula of Salento, the small bit of land that juts out from the larger Italian peninsula and that has been described as the “heel” of the Italian “boot.” In 1480, the area was Neapolitan/Aragonese, meaning it was under the control of the united kingdoms of Naples and Aragon. Otranto’s cathedral dated to the late 11th century and had been the scene, ironically, of the enthusiastic blessing of some 12,000 Crusaders under the leadership of Bohemond of Taranto just before they set sail to take part in the First Crusade (1095-1099). The city’s walls afforded a wonderful view of the Adriatic, but on the morning of July 29, an ominous sight appeared on the horizon: The Ottoman fleet had landed nearby. Thousands of soldiers and sailors began marching toward Otranto, where the garrison of soldiers numbered only around 400. Messengers were sent north to alert the rest of the peninsula of the danger that had arrived from the sea. The castle had no cannons, and the garrison commander, Count Francesco Largo, was aware of the limited supplies and water. Medieval warfare, even after the emergence of cannons, was predicated on stark and often grim choices on the part of the defenders of any city or castle under siege. The defenders could either hope to hold out (especially if a relief army was on the way), or they could negotiate a surrender. Surrender was an option to be considered as early as possible, for the longer a siege went on the harsher the terms might become. Should a city or castle fight to the last and have its walls breached, staggering violence usually followed as the conquering force pillaged, vented its pent-up frustration, and searched for loot and treasure. For the citizens of Otranto, the siege of Constantinople was still well-known. When that city fell, Ottoman troops were allowed to pillage parts of the city, but the key moment came when they reached the famed church of the Hagia Sophia. After breaking down the church’s bronze gates, the Turkish troops found inside a huge throng of Byzantines who had taken refuge and who were praying that the city might be delivered by some miracle. The Christians were seized and separated according to age and gender. The infants and elderly were brutally murdered; the men—including some of the city’s most prominent senators—were carted off to the slave markets; and the women and girls were taken by soldiers or sent into a life of slavery. At Otranto, the terms of the Pasha were ostensibly generous. If the town surrendered, the defenders would be permitted to live. Otranto was forfeit. The answer to the Pasha’s demands was firm: The Christians would not surrender. When a second messenger was sent to the walls to repeat the demands, he was met with arrows from the walls. To settle the issue, the leaders of the castle defense climbed to the top of the tower and threw the keys of the city into the sea. When the determined defenders awoke in the morning, however, some of the soldiers had fled by climbing down the walls and running for their lives. The few hundred inhabitants of Otranto now faced 18,000 fierce Ottomans with barely 50 Neapolitan soldiers. The siege engines and Ottoman cannons brought down a relentless torrent of stones, and waves of Ottoman soldiers crashed against the walls and tried to climb up to get at the frantic defenders. The people of the town boiled oil and water to pour down upon the enemy while others hurled rocks, statues, and furniture. The struggle went for nearly two harrowing weeks until, in the early morning of August 12, the Ottomans breached a part of the wall with their cannons. A spirited defense was waged amid the rubble of the broken wall, but the people of Otranto were hopelessly overmatched, lacking any training in vicious hand-to-hand combat, and exhausted by the ordeal of the siege. Turkish troops slaughtered the stalwart defenders and then rushed through the city killing anyone in their path. They made their way to the cathedral. As in the Hagia Sophia, the invaders found the church filled with people praying with Archbishop Stefano Agricoli, Bishop Stephen Pendinelli, and Count Largo. The Ottomans commanded the archbishop to throw away his crucifix, abjure the Christian faith, and embrace Islam. When he refused, his head was cut off before the weeping congregation. Bishop Pendinelli and Count Largo likewise would not convert and were also put to death, reportedly by being slowly sawed in half. As was the custom, the priests were murdered and the cathedral was stripped of all Christian symbols and turned into a stable for the horses. The Ottomans then gathered up the surviving people of Otranto and took them as captives. Their ultimate fate was in the hands of Pasha Ahmed. The people of Otranto faced the same end as the Christians of Constantinople. All of the men over the age of 50 were slaughtered; the women and children under the age of 15 were either slain or sent away to Albania to be slaves. According to some contemporary sources, the total number of dead was as high as 12,000, with another 5,000 pressed into slavery. (These numbers are almost certainly an exaggeration as Otranto did not likely have a population that high.) Nevertheless, worse was still to come. The Pasha Ahmet ordered the men of Otranto, 800 exhausted, beaten, and starved survivors of the battle, to be brought before him. The Pasha informed them that they had one chance to convert to Islam or die. To convince them, he instructed an Italian apostate priest named Giovanni to preach. The former priest called on the men of Otranto to abandon the Christian faith, spurn the Church, and become Muslims. In return, they would be honored by the Pasha and receive many benefits. At this, the men of Otranto cried out with one voice that they too were willing to die a thousand times for Christ. The angry Pasha Ahmed pronounced his sentence: death. The next morning, August 14, the 800 prisoners were bound together with ropes and led out of the still-smoking battleground of Otranto and up the Hill of Minerva. The victims repeated their pledge to be faithful to Christ, and the Ottomans chose the courageous Antonio Primaldo as the first to be executed. The old tailor gave one final exhortation to his fellow prisoners and knelt before the executioner. The blade fell and decapitated him, but then, as the chronicler Saverio de Marco claimed in the Compendiosa istoria degli ottocento martiri otrantini (“The Brief History of the 800 Martyrs of Otranto”), the headless corpse stood back upright. The body supposedly proved unmovable, so it remained standing for the entire duration of the gruesome executions. Stunned by this apparent miracle, one of the executioners converted on the spot and was immediately killed. The executioners then returned to their horrendous business. The bodies were placed into a mass grave, and the Turks prepared to begin their march up the peninsula toward Rome. Otranto was in ruins, its population gone, its men dead and thrown into a pit, seemingly to be forgotten. All of Italy was by now in a state of alarm. Pope Sixtus IV was reportedly so concerned for the safety of the Eternal City that he renewed the call first made in 1471 for a crusade against the Turks. Hungary, France, and a number of Italian city-states answered the plea. Not surprisingly, Venice refused, still bound by its treaty. The pope also made plans to evacuate Rome should the Turks arrive near the gates of the city. Time was now of crucial importance to the safety of the Italian peninsula, and the king of Naples, Ferdinand I, quickly gathered his available forces and charged his son Alfonso, duke of Calabria, with the campaign. The two weeks that were purchased through the sacrifice of the people of Otranto became the key to organizing an effective response to the invasion, for the Neapolitan forces now had the chance to bottle up the Turks in Apulia rather than battling them across Italy. Toward the end of August, Pasha Ahmed sent 70 ships of the Ottoman fleet to attack the city of Vieste. Turkish troops pushed on and destroyed the small church of Santa Maria di Merino and in early September set fire to the Monastery of San Nicholas di Casole. The monastery’s famed library was reduced to ashes. In October, the Pasha attacked the cities of Lecce, Taranto, and Brindisi. He left behind a garrison at Otranto of 800 infantry and 500 cavalry. But time and the weather were now against the Turks. Ahmed had lost his chance to strike northwest, and he was finding supplies and food difficult to find in Apulia. He was also aware of the impending advance of the Neapolitan forces. He therefore decided to set sail from Italy before the winter storms in the Adriatic cut him off completely from all communication with Constantinople. The garrison at Otranto would remain, and the Pasha intended to return after the winter with an even larger army. Duke Alfonso led his army into Apulia in the early spring of 1481. He was assisted by a force of Hungarian troops that had been dispatched by King Matthias Corvinus of Hungary, a longtime foe of the Turks and a monarch eager to deliver them a defeat in Italy. Like the people of Otranto a year before, the Turkish troops retreated to the rebuilt defenses of the city as the Christian army arrived at the gates on May 1. The city was thoroughly invested. The siege of Otranto continued apace for several months, culminating in two large assaults, in August and then September 1481. The city fell with the second attack, but the last vestiges of Otranto were destroyed in the vicious fighting. None of the Ottoman troops were left alive. While the siege engines of the Neapolitans rained down on the Ottoman defenders, across the Adriatic on May 3, 1481, Sultan Mehmet II the Conqueror died suddenly at the age of 49 at his military headquarters at Gebze, while planning his next war. It was believed that he had been poisoned, perhaps by the Venetians. Any thought of a relief force sailing from the Ottoman Empire for Italy died with Mehmet, for his heir, Bayezid II, was forced to engage in a bitter struggle with his brother Cem for the throne. Pasha Ahmed fell out of favor at the court and was recalled to Constantinople by Bayezid and imprisoned. On November 18, 1482, the one-time great general was executed at Adrianople. The Ottoman ambitions in Italy were ended. Had Otranto surrendered to the Turks, the history of Italy might have been very different. But the heroism of the people of Otranto was more than a strategically decisive stand. What made the sacrifice of Otranto so remarkable was the willingness to die for the faith rather than reject Christ. The martyrs of Otranto were not forgotten by the people who returned to Apulia after the fighting was over. The bones of the martyrs were gathered up, placed in reliquaries, and installed in a chapel just off the main altar in the restored cathedral. Some of the relics were also sent to the church of Santa Caterina in Formello at Naples. On October 5, 1980, Pope John Paul II visited Otranto and said Mass in honor of the martyrs in the cathedral. 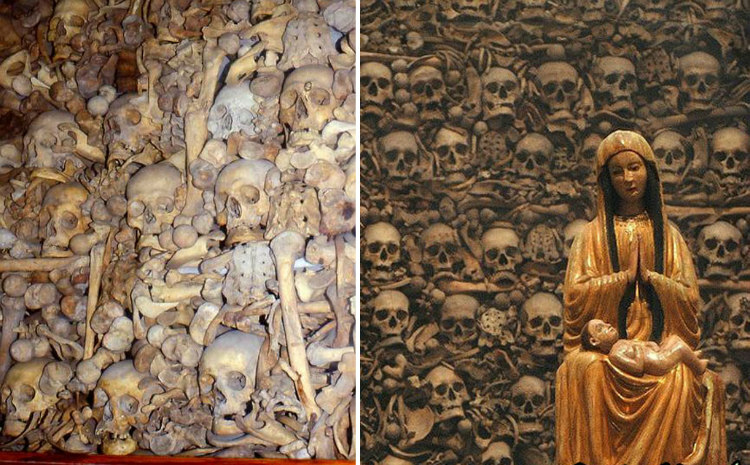 Twenty-six years later, in July 2006, Pope Benedict XVI gave his formal approval for the promulgation of a decree by the Congregation for the Causes of Saints that the Martyrs of Otranto were killed out of “hatred for the faith” (in odium fidei) in Otranto on August 14, 1480. This was the formal recognition that they were martyrs.